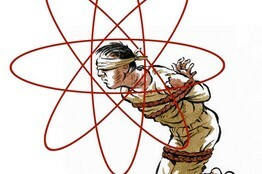 HRANA News Agency – The West’s single-minded focus on the nuclear dossier has permitted Iranian authorities to widen their violations of human rights. With tensions mounting over Iran’s nuclear program, the West has dealt the Tehran regime crippling blows on several fronts, including through sanctions, the targeted killing of scientists, and cyber operations such as the Stuxnet virus. Tehran is no doubt reeling but regime leaders have spotted a silver lining: The West’s single-minded focus on the nuclear dossier has permitted them to widen their violations of human rights.